'The U.N. Human Rights Council has lost its legitimacy as it focuses obsessively on attacking Israel instead of working on resolving the real human rights problems plaguing the world. The Council has lost all touch with reality and the original intent of upon which it was founded,' Danon said. Lynk asserted that he has the independence to choose his topics under the framework of his mandate given to him by the council. Anne Bayefsky, professor and director of the Touro Institute on Human Rights and Holocaust, told Fox News that Lynk's title gives the opposite impression of what he actually does. 'Link demonstrates how dangerous the U.N. Human Rights Council really is,' she said. 'The Council gave him the misleading title of U.N. human rights expert investigator, knowing in advance he had made up his mind about the subject he was to investigate. Lynk went into the U.N. job wildly anti-Israel, and voilà, he now produces statements and reports containing wild anti-Israel pronouncements, starting with analogies to apartheid South Africa.'..." The UN "expert" is proving to be a deep embarrassment to the legal fraternity from which he comes. On October 26 in the basement of the UN General Assembly building in New York, Canadian law professor Michael Lynk spent his twenty minutes of fame inventing an astounding array of rules. Using the words law/lawful/legal/illegal forty-five times, he had no problem with a UN job that violates the elementary principle of non-discrimination. The express UN mandate of this UN rapporteur is to investigate Israeli human rights violations and ignore everything done by Palestinians. Lynk was hand-picked by the UN Human Rights Council because of his well-known anti-Israel biases. The Israeli delegate pointed out this UN's human rights "expert" "has compared Israel to the Nazis" and "three days after 9/11, Lynk blamed not the terrorists, but the West, for the tragedy." Welcoming Lynk to the UN General Assembly's Third Committee, however, was Syria. Notwithstanding this committee is charged with dealing with human rights,, delegates listened respectfully to the Syrian delegate calling Israel and ISIS "brothers." Michael Lynk: "Israel's role as occupant has crossed the red line into illegality...What are the implications of a finding of illegality? Using the precedent of what occurred in 1971 with the illegality of South Africa...limit trade and eventually to avoid investment or any other kind of recognition or non-cooperation... [E]nsure a respect for international law, including the duty of non-recognition.."
Syria: "We support Mr. Lynk's report and we encourage him for dealing with state terrorism which is exercised by Israel against the Palestinian people...They do not believe in a culture of peace...Israel and Daesh are brothers." Namibia: "...the Israeli authority...is reminiscent of the apartheid colonial regime..."
Indonesia: "Extrajudicial killing and other form of human rights abuses that have been conducted by the occupying power..."
Islamic countries at the UN spent an afternoon accusing Israel of "grave violations" and "racist policies" over Israel's use of its own natural resources. The accusations were made on October 23, 2017 during an annual debate in the UN General Assembly's Second Committee – composed of all 193 UN Member States – on the topic of "Permanent sovereignty of the Palestinian people in the Occupied Palestinian Territory, including East Jerusalem, and of the Arab population in the occupied Syrian Golan over their natural resources". The debate immediately followed the presentation of a report by ESCWA (the UN Economic and Social Commission for Western Asia) Executive Secretary Mohamed Ali Alhakim – whose predecessor infamously accused Israel of "apartheid". The report delivered by Alhakim is entitled "Economic and social repercussions of the Israeli occupation on the living conditions of the Palestinian people..."
Numerous Islamic states accused Israel of violating the rights of Arabs inside Israel, notwithstanding the deplorable living conditions and widespread discrimination in nearby countries such as Syria and Iran. Nearly hysterical accusations were made of Israel, such as it being "ruthless," of "lopsided treachery," "crimes against humanity," "pillaging," and "abominable policies." Deaf to the irony, many countries alleged the Arabs of the Golan Heights, which Syria claims as its territory, were suffering by not being under the control of the Syrian regime. Malaysia: "We condemn this ruthless and lopsided treachery towards the people of Palestine roots from the discriminatory Israeli policies and human rights violations..."
Qatar (on behalf of the 56-member Organisation of Islamic Cooperation): "Moreover, the occupying Power continues with its exploitation of natural resources; the segregation, isolation and obstruction of Palestinian movement by numerous measures, including the annexation, apartheid Wall... Here, we reiterate that the Palestinian people cannot remain the exception to the responsibility to protect civilians from atrocities and flagrant breaches of the law. We stress that the matter of accountability is as urgent as addressing the humanitarian crisis, for without it Israel's impunity and depravity against the Palestinian people will surely be further emboldened with disastrous impact." Iran: "Such collective punishment measures by Israeli regime is tantamount to a grave breach of international humanitarian law, constitute as a crime against humanity and pose a serious threat to international peace and security as well as to regional stability." Yemen: "Mr. Chair, what we have just stated is only part of the Israeli practices and policies which are mentioned in detail by United Nations reports, including this ESCWA report, as well as the report of the Fact-Finding Commission, which are all clear proof of the systematic discrimination that Israel, the occupying power, practices and imposes on all facets of economic, social, and environmental life in the occupied Arab territories. This is a grave violation of the provisions of international law, especially international humanitarian law and human rights law. These policies, these abominable policies, have created an untenable economic and social situation..."
Syria: "Israeli occupation authorities continue their blatant defiance of relevant Security Council resolutions, particularly Resolution 497 of 1981, by imposing their racist laws on the Syrians in the occupied Golan, lately taking a decision to conduct elections of local councils next year in the occupied Golan.... Israeli occupation sources-authorities persist in their racist policies..."
Saudi Arabia: "Israel must...cease exploiting and pillaging the resources of Palestinians as well as polluting their environment." Qatar: "...this report published this year outlines the suffering of the Palestinian people and the suffering of the Arab people in the occupied Syrian Golan as a result of the discriminatory policies and practices implemented by Israel." Iraq: "The question of Palestine has been Iraq's question number one, despite the challenges faced by my country in the war we are launching on behalf of states of the world forces of evil and darkness represented in the terrorist Daesh gangs. We are at the forefront of advocating the question of Palestine, and despite the historic injustice to which the people of Palestine is subjected, Israeli occupation practices and settlement policy...adversely affect the socioeconomic situation of the population who are living under abominable occupation where Israeli occupation forces use disproportionate force to impose racist discriminatory laws." Libya: "Palestinian people at all levels suffers from discrimination... Israel destroys all means of living in the occupied Arab territories..."
Syria (separate statement): "Israel is simply a rogue state that does not recognize the United Nations and international law is the desperate attempt, because the truth stands clear. And in Syria, the compass will continue to point in the right direction... And they go beyond that and interfere in the affairs of a sovereign state by offering unlimited support, including direct aggression on the sovereign lands of Syria in order to further the cause of terrorists and their destructive project. And this does not come as a surprise to us, because Israel and those terrorists share their interests and their goals." Iran (separate statement): "[A] regime famous for such unlawful acts, apartheid policies, and war crimes which were documented by the UN allows itself to accuse other countries in such a sinister way. Iran makes its honest efforts to contribute to peace and stability in the Middle East..."
The Israeli representative responded by pointing out the absurdity of the discussion and the accusations of oppressive regimes like Syria. "[I]t is surreal to hear, year after year, allegations of human rights violations by Israel from some of the world's most infamous human rights abusers... The Syrian delegate's cynical attack on my country today are just another desperate attempt to divert attention from the crimes that they commit against their own people on a daily basis. The population on the Golan are well and alive. This is something which we unfortunately cannot say about hundreds of thousands of Syrian citizens killed in Syria during the last year. To the Syrian distinguished representative, I would ask, perhaps you would inform the committee how dropping barrel bombs on schools, markets and hospitals are compatible with development." "Every so often the United Nations decides to dignify a tyrant, or a tyranny, in ways so in-your-face perverse that it draws public attention, provokes highly embarrasing protest -- and the UN scuttles to back away. So it went with the recent decision by the World Health Organization to appoint as one of its goodwill ambassadors the longtime tyrant of Zimbabwe, Robert Mugabe. For the UN, the embarrassment will likely fade. But the over-arching problem here -- of which Mugabe's fleeting four days as a goodwill ambassador is merely a symptom -- is a United Nations that inveterately dignifies and honors tyrants and tyrannies, though usually in less prominent fashion. There's a solid argument to be made that under the UN's 1945 Charter, which says that membership is open to peace-loving states that respect human rights, today's Iran does not belong in the UN at all. But at the UN, Iran's regime not only enjoys a seat as one of the 193 member states. It also enjoys the privileges of holding seats on a remarkable array of the governing boards of major UN agencies..."
The United Nations Human Rights Council and the U.N.'s human rights chief are threatening companies in the U.S. and around the world for doing business with Israel. Monday, Maryland become the 23rd state to adopt anti-boycott rules. It is urgent for Congress to pass the bipartisan Israel Anti-Boycott Act, a vital tool to prevent anti-Jewish discrimination and to protect American businesses from blackmail. On Oct. 16 the CEO of Israel's telecom giant Bezeq, Stella Handler, posted a two-page letter that her company had received from the office of U.N. High Commissioner for Human Rights Zeid Ra'ad Al Hussein, a Jordanian prince. 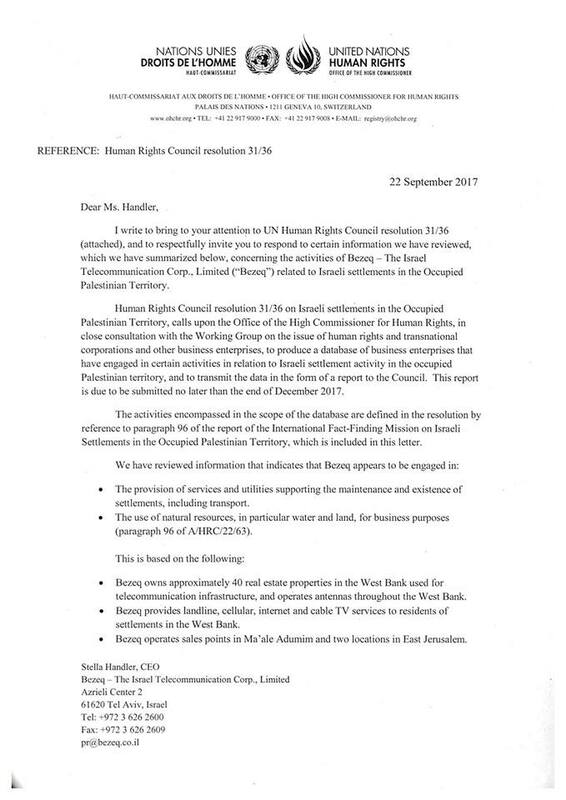 The letter, dated Sept. 22, lists Bezeq's operations that allegedly are ensnared by a resolution of the U.N. Human Rights Council. The Human Rights Council is the U.N.'s top human rights body. The menacing letter neglects to mention the human rights credentials of the 35 Council members that passed the resolution back in 2016 – states like Algeria, Bolivia, Burundi, China, Cuba, Qatar, Saudi Arabia, the United Arab Emirates and Venezuela. More specifically, the Council resolution calls for the production of a "database" of businesses that "directly or indirectly" are connected to Israeli settlements. In effect, the "database" is a blacklist. High Commissioner Zeid has said he intends to release the database/blacklist by the end of this year. The letter Zeid sent to Bezeq is not unique. According to leaks to various news agencies, Zeid has sent similar letters to 150 companies around the world. Thirty of such companies are said to be American. Recipients reportedly include Coca-Cola, Caterpillar, Priceline.com, TripAdvisor, and Airbnb, as well as Israeli businesses such as pharmaceutical leader Teva, the country's two largest banks (Hapoalim and Leumi), the bus company Egged, the national water company Mekorot, and other major Israeli businesses in addition to Bezeq. Zeid's letter dictates that the company has 60 days to send "information or comments...confirming, clarifying or contesting" the U.N.'s account of the company's business dealings in any area that the U.N. has decided is Arab territory. The information received, continues the U.N. letter, will "enable adequate consideration of whether there are reasonable grounds for inclusion of Bezeq in the database, as per the Council resolution." In plain English, companies face public censure – driven by the U.N.'s vast global network – unless they comply with the demands of Zeid and the Human Rights Council. Bezeq's CEO vowed her company would not be intimidated, and declared that Bezeq would "protect the rights of all our customers without discrimination" regardless of their religion, race, gender or where they lived. The fact is that U.N. Human Rights Council resolutions have the legal status of toilet paper. But that isn't stopping the high commissioner from huffing, puffing and bluffing. And alarmingly, until now, nearly all the recipients of these letters appear to have been playing by the blackmailer's rules. The "don't you dare go to the police" routine has thrown a cone of silence around the whole affair. Shareholders, employees, and communities that depend on the well-being of the blackmailed companies – along with the elected representatives responsible for serving these constituents – have been kept in the dark. Bezeq has brought the U.N. moves out of the shadows. This is the most egregious boycott, divestment and sanctions (BDS) campaign directed against Israel ever launched by the United Nations. It is not the first, but it is the most audacious. At its core, BDS is a response to the failure of Arab combatants to defeat Israel on the battlefield. Destroying Israel through economic isolation is perceived by Israel's enemies as Plan B. The two goals of the U.N. blacklist are first, devastating Israel's economy, and second, circumventing a negotiated solution to the Israeli-Palestinian conflict. For according to existing legal agreements, ownership of disputed territories is to be determined through negotiations between the parties – not by U.N. bullies. Asked about the blacklist on Aug. 22, State Department spokesperson Heather Nauert, told reporters: "We have made clear our opposition regarding the creation of a database of businesses...and we have not participated and will not participate in its creation or contribute to its content." The response is disingenuous. Last December the Obama administration agreed in the General Assembly to the overall U.N. regular budget, knowing full well that the budget included funding for the blacklist. Hence, American taxpayers are currently paying 22 percent of all the costs of creating the blacklist. That sounds like a "contribution" to those of us who don't speak diplo-babble. U.N. High Commissioner Zeid Ra'ad Al Hussein is the last person on Earth who should be telling American companies how to run their businesses. And on the off-chance that U.N. letterhead makes American CEOs nervous, they need to be reminded that they owe their allegiance to American law and public policy. It is past midnight for Congress and President Trump to step up and answer this U.N. assault on American businesses and our ally Israel. - The expeditious adoption of the Israel Anti-Boycott Act. - The refusal to send Prince Zeid another penny.